« The Book: An Extension of the Eye? 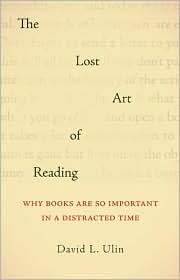 I recently read The Lost Art of Reading: Why Books Matter in a Distracted Time by David L. Ulin. I started it at approximately 11:00PM, and next thing I knew it was after 2:00AM, and I was nearing the end. I hadn’t read a book in a single sitting in years – I’d become too easily distracted by my smartphone, PVR, and laptop. The Lost Art of Reading is not a long book, with only 150 short pages, and in fact you could probably classify it as an extended essay rather than a novel. I highly recommend it for anyone who’s ever categorized their personal library or smiled at the smell of a large, slightly musty used book store. Ulin begins with the tale of his teenage son who is forced to not only read but annotate The Great Gatsby for homework, which causes his son to complain that “it would be so much easier if they’d let me read it.” After finally finishing the book, Ulin’s son suggests “This is why reading is over. None of my friends like it. Nobody wants to do it anymore.” If you’ve talked to a teenager recently who owns a smartphone, laptop, and video game system, you’ll realize how realistic this is. How many teachers have ruined teenagers’ interests in reading in some similar manner? The tale of his son’s Great Gatsby homework is woven throughout the essay, as Ulin deliberates his son’s proclamation, wondering if perhaps he’s right. He reflects on his own childhood, and his obsession with books, book stores, and authors, noting that he “frames the world through books.” This book critic loves reading and everything associated with it, including wondering about what the future of reading will look like. This book had a lot of really great passages which I dog-eared, and I hope it’s okay to share them. If nothing else it should encourage everyone to go out and purchase this book (no, that’s not an affiliate ad) – it’s a great quick read. The first passage that struck me was Ulin’s description of his teenage bookshelf. Isn’t that what a bookshelf really is? It represents your interests, tastes, desires, and in the books you have purchased but not yet read, perhaps some of your aspirations. Books give form to these ideas, making them substantial and tangible. Ulin’s voice is ultimately optimistic (yet realistic), as he explores what it is that reading has to offer us. Next I’ll take a look at what book stores mean to him.